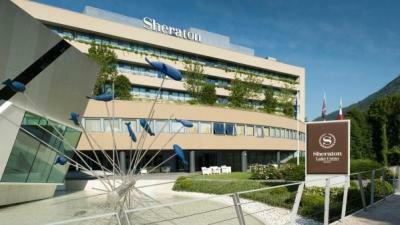 Our conference hotel is the Sheraton Lake Como, which is just minutes from the historic centers of Como and Cernobbio. It is just a short walk to the lakeside pier to catch the boat that will take you into the center of Como or walking in the opposite direction takes you to the small restaurants and shops in the center of Cernobbio. location for fine dining. Italy’s renowned cuisine is given a modern twist at Gusto Restaurant. The flavours of South American grills (quincho) have inspired Kincho Restaurant, which includes a pizzeria and a bar. Join us at Fresco Bar for a cocktail or a glass or wine. Opening onto the private park beside the hotel, the fine dining Kitchen Restaurant tempts guests with its gourmet delicacies. 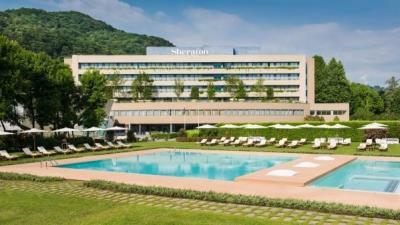 • Six nights (6) nights’ accommodation in selected room at Sheraton Lake Como. • Buffet breakfast each morning. • All taxes and service charges including VAT and city taxes. • Please note that we will be organizing a full day tour option on Sunday, October 7th. If you plan on the tour, you will need to arrive a day early and book an extra hotel night. Pricing Plan A: Superior Room (maximum 2 persons per room). Pricing Plan B: Deluxe Room (maximum 3 persons per room). Pricing Plan C: Deluxe Pool view (maximum 3 persons per room). Pricing Plan D: Club Room (maximum 3 persons per room). Pricing Plan F: Suite (maximum 4 persons per room). How To Register: Please download and print the hotel registration forms. Completed hotel registration forms may be scanned and emailed to NGreen@sanditz.com or faxed to Nadine or Chris at Sanditz Travel at (001) 860-233-2331. Queries regarding hotel registration: Please contact Nadine or Chris at Sanditz Travel at 860-344-7048 in the USA or email ngreen@sanditz.com or ctanguay@sanditz.com. Note: Prices may increase if there are major changes in the exchange rates or increase in taxes. All rates are quoted in USD dollars. All hotel payments are processed by Radiology International Inc.
Reservations should be made through our official travel agency, Sanditz Travel Management. Please call Nadine Green or Chris Tanguay at (001) 860-344-7048 ext. 1600 or 1602.